I'll be playing a cello/piano duet with Frances Duff entitled "First Light," written in 1986 for Jennifer Schauffler-Vircsik and Theatre of the Heart in NYC. Sat. 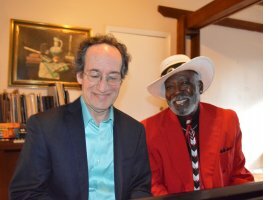 June 20th, 7:00pm one show only Sidney Barnes & Richard Shulman at the Classic Wineseller 20 Church St. Waynesville, NC. On Sat. July 10th from 6:00 - 10:00 pm our band Echoes in Rhythm will be playing 1920's and 30's music for a dinner/dance Great Gatsby Ball at the 1927 Lake Lure Inn & Spa 2771 Memorial Hwy, Lake Lure, NC. Joining the band will be two wonderful vocalists who specialize in 20's and 30's swing music, Russ Wilson and Heather Masterton. Fri. June 19th 7:30 pm participating in the Composers' Concert at Streamside Concerts, 721 Streamside Dr. Arden. Email salire@yahoo.com for information and tickets or click on this link. Thurs. June 25th, 7:00 - 10:00 pm Solo Keyboard at the Twisted Laurel Weaverville 10-A South Main Street in Weaverville. Fri. July 3rd, 7:00 - 10:00 pm Echoes in Rhythm featuring Sidney Barnes at the Twisted Laurel 10-A South Main Street in Weaverville. Sun. July 11th 2:00 - 5:00 pm workshop UR Light Center "Recognizing and Expressing the Divine through Music and in Communication: Bringing the consciousness behind healing music into day-to-day interactions" - an interactive workshop facilitated by Richard Shulman. Fri. July 17th, 7:00 - 10:00 pm Echoes in Rhythm featuring Sidney Barnes at the Twisted Laurel 10-A South Main Street in Weaverville.